I’m the Production Manager on the production; my role is to look after all the technical aspects of the production, to liaise with the Director, Adam, and the Designer, Katie, to arrange the set in each venue to make the best position for it and the audience. My role is also to look at the logistics of the tour, to contact each venue to let them know what we are bringing set wise and the timings of the set-up. I also run the lighting and sound for each performance. 2.What do you love about the play? I love the memories within the play and how history is set to repeat itself. 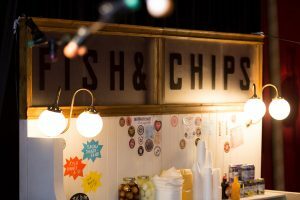 3.Tell us your Chip Shop memory? As a family we used to holiday in Anglesey and there is a fantastic chippie in Benllech, I remember standing in the queue collecting Fish and Chips for the whole family as the sun goes down over the Irish Sea. 4.Who was your first love? Joanne Brown, when I was 17. 5.Where are you most looking forward to visiting on the tour and why? I’m looking forward to visiting ThimbleMill Library as it’s just down the road from where my mother was born and I’ll have family visiting the show. 6.What’s your order at the chippy?